Ear Tragus Piercing Jewellery - Helix Piercings A range of purpose designed ear piercing jewellery for many of the popular ear piercing locations. These include helix, conch and tragus. 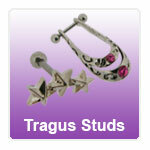 Extensive designs of Tragus studs and tragus bars in Titanium, steel and Bioplast. Suitable jewellery for ear piercings also includes, Labret Studs, Straight Barbells, Circualr Barbells (Horseshoes) and Ball Closure Rings (BCR's). "cant fault this site - found what i wanted - ordered and it came really quickly. much cheaper than anywhere else and fastest shipping ever"
"good Price , Quick delivery . Recommendable"
"Delivery was quick, goods were packaged well"